A centuries old vegetable that is often used as a fruit, Rhubarb appears in late winter from greenhouses, then field grown throughout the spring and early summer. The two crops differ in size and flavor with the field grown version more popular in our area due to price and availability. There is much information that the stalk should not be eaten raw, but cooked and that the leaves should not be eaten at all. Rhubarb retains its distinct color and sour taste when cooked and is found in any number of pies, tarts, preserves, jams and syrups. A plant originally from northern Asia and was introduced to the United States at the end of the eighteenth century. 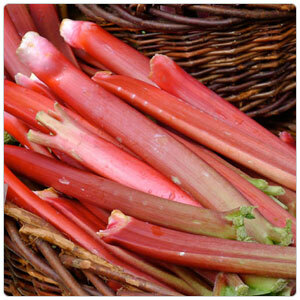 Usually eaten as a fruit, rhubarb is a vegetable belonging to the same family as sorrel and buckwheat. There are about 20 varieties, and only the thick, crunchy stems are edible.